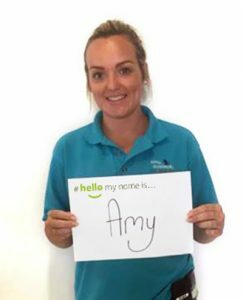 I am a 25 year old Healthcare Play Specialist at Brighton and Sussex University Hospitals NHS Trust, primarily based within the Children’s Emergency Department at The Royal Alexandra Children’s Hospital. I qualified for my degree in Healthcare Play Specialism for Sick Children in June 2015 at the University of West London. Prior to this, I worked within various childcare roles, spanning from supporting new-born babies to five year olds, and decided I wanted to use these skills to support children and families within a hospital environment. I was fortunate enough to gain my qualification whilst working with the play team within the children’s hospital. I feel privileged to work alongside fantastic and dedicated colleagues in the play team, as well as multi-disciplinary colleagues right across the hospital. I feel really proud that Children’s Services at our Trust has recently been rated as Outstanding by the Care Quality Commission, and even more proud that that’s not slowed anything down! We’re always looking for new ways to ensure that patients and their families receive the best possible care by teaming together and working closely with partners and charities including Rockinghorse, Wishing Well and Theodora Giggle Doctors. We have a phenomenal play centre and sensory room and I also spend a lot of time out on the wards. I use therapeutic play and distraction techniques to support patients and their families throughout the hospital journey, with the aim of minimising distress as much as possible. Outside of work, my hobbies include shopping, socialising with friends, walking the dogs and obstacle course racing, all followed by a nice cup of tea and a biscuit!